The Congrega Maria SS. Addolorata was formed in 1948. 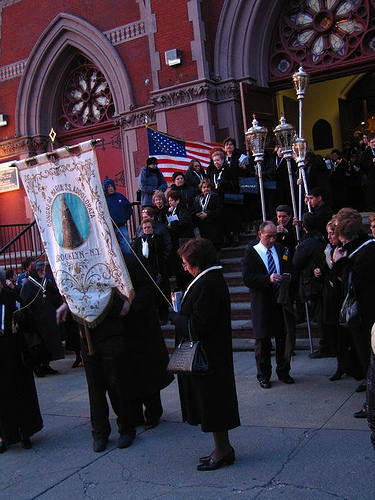 The immigrants who came from Italy were very proud to bring their Patron Saint from Mola di Bari with them to Brooklyn so that they could continue their traditions in their new home. While keeping their Italian traditions was important to them, it was equally important to assimilate to their new home and live the American dream. Marching in the Columbus Day Parade on 18th Avenue is the perfect way to honor both Italy and America. The congregation also holds numerous events throughout the year including reciting the rosary, Picnics, Marian Pilgrimages, children’s socials and dinners. One of the traditions they brought with them from Italy is the traditional processions of Good Friday and the Feast of Maria SS. Addolorata. 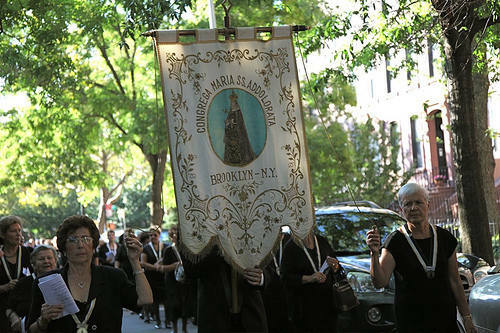 These processions are held in Carroll Gardens Brooklyn because this was the first stop many of the immigrants from Mola made when entering the United States. Each procession concludes with services at Sacred Hearts-St. Stephen Roman Catholic Church where the statue of the Madonna resides for the past 60 years. 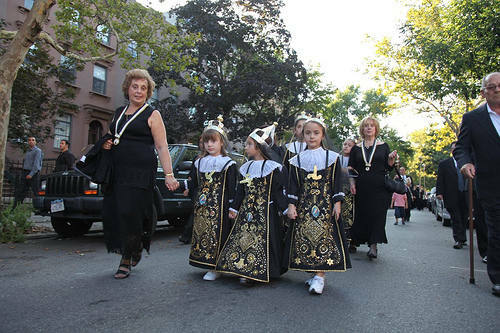 The devotion to the Madonna is a bond that the community shares, both old and young alike. It is a symbol of their culture and their faith. Their children and grandchildren are actively involved in carrying out their traditions. From carrying the statue during the processions, to participating in the various activities they have for them throughout the year, they are honored to carry on the traditions of their parents and grandparents. As the Congregation celebrates their 60th anniversary they renew their commitment to Maria SS. Addolorata and their Italian identity, they are mindful of the sacrifice it took for their people to come to America and they continue to hope that the traditions do indeed live on for future generations.